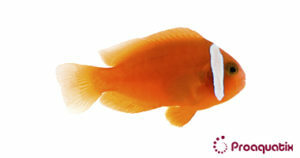 A red-colored clownfish with a white stripe running through the opercula. Some specimens may possess a black patch on the posterior flank, while the white stripe may contain reflective blue pigments. The pelvic fins are red. Natural range spans from Southeast Thailand to Indonesia and Philippines, northward to southern Japan. Like all clownfishes, Amphiprion frenatus is a sequential hermaphrodite. The largest individual present will exert dominance and become reproductively female. The next largest fish will become reproductively male. The female may not tolerate other smaller individuals. Presence of the female significantly impedes the growth rate of the male.